Background: Total vascular exclusion (TVE) of the liver has been used to increase the safety of hepatectomy and the feasibility of difficult resections. Until recently, however, concern about the detrimental effect of warm ischemia has limited the use of this technique to patients with normal liver parenchyma. Objective: To compare surgical outcomes of 12 patients with abnormal livers (group 1) with outcomes of 48 patients with normal parenchyma (group 2), based on the hypothesis that uncontrolled bleeding may be more detrimental than planned hepatic ischemia. Design and Setting: Retrospective analysis of 60 consecutive patients undergoing liver resection under TVE in a university medical center. Patients: All 10 patients with cirrhosis had albumin levels of 30 g/L or higher and normal prothrombin times preoperatively; none had ascites. Two patients with cholestasis (one with cholangiocarcinoma and one with hepatocellular carcinoma) are included in group 1. Intervention: All 12 group 1 patients and 44 of 48 group 2 patients underwent total or extended lobectomy, with TVE induced by clamping the hilum and the vena cava above and below the liver during parenchyma division. Main Outcome Measures: Hospital survival and selected surgical and laboratory parameters. Results: Operative times, ischemic times, and blood loss (1975±1601 vs 1255±1291 mL) (P=.10) were comparable in both groups. 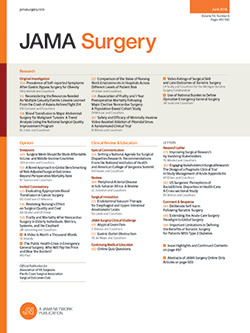 Sixty-day operative mortality was zero in both groups. There was an increased rate of complications in group 1 (44% vs 17% [P=.06]). Transient abnormal liver function was observed in both groups. However, significant delay in restoration of normal function was observed in group 1 with respect to bilirubin levels and prothrombin time.